View More In Hybrid Bikes. 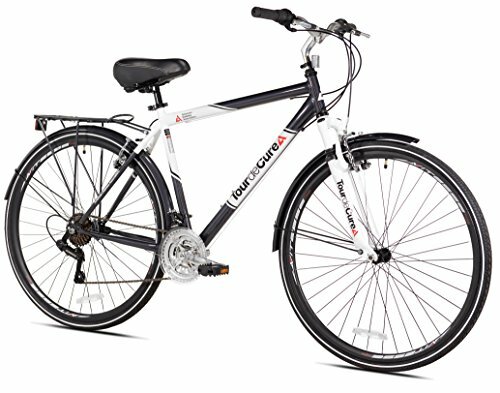 The tour de cure hybrid bicycle benefits both the rider with a healthier lifestyle, and the American diabetes Association with a $10 donation for every sale. This bicycle features a comfy seat and upright stem and handlebars for a delightful heads up ride. A lightweight aluminum frame and suspension fork keep the bumps in check and the high profile aluminum rims and larger diameter wheels translate less effort into more speed. The 21 speeds from Shimano featuring their easy twist revo Shifters make easy work of big hills and propel you effortlessly on flatter terrain, while you keep everything under control with front and rear alloy linear pull hand brakes. So help yourself to better heath, while you help others. If you have any questions about this product by Tour de Cure, contact us by completing and submitting the form below. If you are looking for a specif part number, please include it with your message.